Sorting the spin from the facts: how big can the surveilling city that Sidewalk Labs plans for Toronto get? I am reaching out about the above mentioned article. The image that accompanies the article is a picture of designated waterfront area with Quayside, specifically, highlighted. 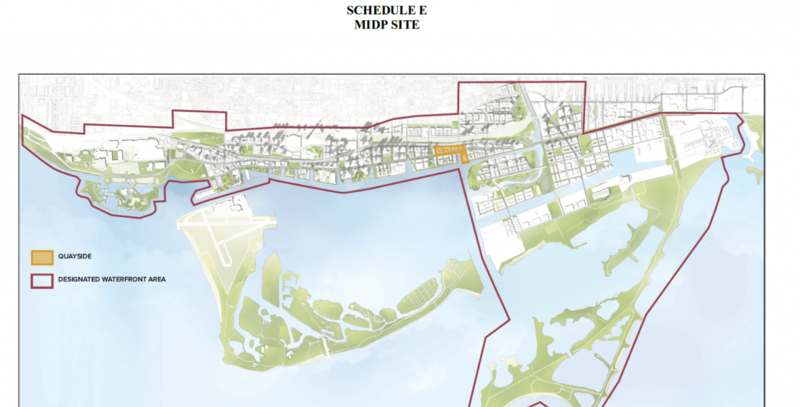 Sidewalk Toronto’s MIDP [Master Innovation Development Plan] will address Quayside only, it does not expand across the entire waterfront designated area as the article states. Can you please correct this within the article? To support her assertion that my findings are incorrect, Berlin Rosen's Molly Henderson sent along a misleading FAQ prepared by Waterfront Toronto to diffuse mounting concerns over the City of Toronto's Master Innovation and Development Plan (MIDP). To understand how the FAQ obscures the nature of the project, consider this sentence: "The only commitment at this time is to a process to create a plan for Quayside that will meet the objectives set out in the RFP [Request for Proposals]." On a first reading, this seems to imply that private city-within-a-city will be limited to Quayside, the 12-acre site that everyone has been talking about to date. But then, later, the FAQ leaves wiggle room regarding the true size of the slated area to be "developed": "Any ideas proposed more broadly than Quayside must be in service of achieving the shared goals of the project and be supported by a business case demonstrating the need for scale to achieve the objectives." Now, if you look at the map on page 42 of the Plan Development Agreement (PDA) struck between Sidewalk Labs and Waterfront Toronto, which is the focus of Cory’s Dec. 17 blog post and my research, you'll see the MIDP site. It’s 2,600 acres, stretching over a huge swath of Toronto and including the iconic Air Canada Centre, Union Station and CN Tower -- and also covering a big chunk of real estate, including the Port Lands, that Canadian taxpayers are shelling out billions to flood-protect, beautify and prepare for development. The PDA states that [bolding added for emphasis]: "Notwithstanding anything herein to the contrary, Waterfront Toronto will ensure that any BIP [Business Implementation Plan] proposed, recommended and/or submitted by it or on its behalf to the City of Toronto for consideration, for the Quayside Parcel and for any additional parcels included in the MIDP is consistent with, and does not limit, conflict with or constrain, the terms included in the MIDP Scope or this Agreement or reasonably expected to be included in the MIDP and Implementation Agreements or, after approval of the MIDP, will be consistent with the MIDP." So: the area in play is all 2,600 acres. The PDA allows them to develop anything "consistent with the MIDP." And who gets to decide whether something is "consistent with the MIDP?" The PDA states that only approval of Sidewalk Labs and Waterfront Toronto is required for the MIDP – not Toronto’s city council, nor the Ontario or federal Canadian legislatures. The PDA also says “[a]ny proposed options at scale shall be subject to and closely tied to the achievement of the MIDP Targets and supported by robust business planning and financial analysis." This may sound good but we've been through this before very recently and we know how it turns out. Just two weeks ago the Auditor General of Ontario released her 2018 annual report in which among other things she slammed Waterfront Toronto for its dealings with Sidewalk Labs. She also took the Ontario transit agency Metrolinx to task for letting manifestly faulty business-case analyses be used to support hyper-politicized decision-making. Now the PDA does also say that government approvals will be needed for implementation of aspects of the MIDP beyond Quayside: “MIDP will be subject to various contingencies, such as the receipt of certain governmental approvals and clearances, approvals of or agreements with landowners or other third-consents." That’s because a lot of the land and buildings in the MIDP area aren’t owned by Waterfront Toronto or the City of Toronto. But once the MIDP is signed it’s irrevocable and the doors will be open to widespread changes to bylaws, zoning, etc, to let Sidewalk Labs and Waterfront Toronto implement the MIDP. “Part of the reason again we need to partner with an entity like Waterfront Toronto is they have spent the last 15 years developing those relationships which we will never develop to the same extent that they could. ... Now obviously we’ve got a provincial election [in Ontario in June 2018] that we ... have no idea what’s going to happen. But the fact is the parliamentary system actually makes it easier compared to our state level and our national government level. I mean could you literally imagine in the U.S. not just in the era of Trump but any time of having represented in one organization three levels of government? It would just never happen in America. The ability to get things done if there’s alignment at the provincial and national governments, at least they believe in what you’re doing, is much greater... And that’s especially important because when you talk about innovation and you talk about literally innovating across building codes and ... zoning regulations and transportation, and all these different elements, we’re gonna need a lot of work with the regulators at the provincial and the national level. ... So on a net basis, I actually think that being here is a big positive." “We [Sidewalk Labs] believe the government should do the minimum necessary to make the market function. But sometimes that’s a lot. Or even everything. Canada is fortunate to have leadership with a similar approach to the relationships between the public and private sectors. As Ontario and the city of Toronto. For Sidewalk Labs, this was a big part of what drew us to respond to Waterfront Toronto’s call for an innovation and funding partner." So all three levels of government in Ontario – and my bet is that tough-talking Ontario Premier Doug Ford is on the same page – are keen to let Doctoroff and his gang at Sidewalk Labs have their way with some of the most valuable real estate in North America. Want more proof that Berlin Rosen’s spin is part of this high-level, stealthy effort we’ve uncovered to let Big Tech take over Toronto’s priceless waterfront? Documents sent to me and tweeted about yesterday by Bianca Wylie -- which resulted from a Freedom of Information request by consultant Bernard Rudny -- included a February 21, 2017, memo from an official at the Canadian Privy Council Office to Prime Minister Justin Trudeau. The memo says Waterfront Toronto’s intention is that once the agreement to develop Quayside is finalized and construction under way, “planning for the Port Lands scale up [would be] beginning almost immediately." Rosemary Frei is a Toronto-based activist and journalist who enjoys digging into the underbelly of political decision-making.